The above info came from Amanda Taylor, and was edited by yours truly (contact me). The image came from Amazon.com. 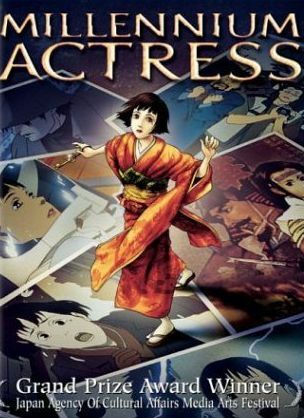 It's been 30 years since since Chiyoko had gone into retirement from her days as a movie star. One day a director named Genya Tachibana and his camera man Kyoji Ida decided to do a documentry on her. As they visit her, Genya hands a box with a key inside to Chiyoko. Holding the key in her hands she tells Genya and Kyoji about her life and how it made her feel like she has lived 1000 years. Her tale draws both Genya and Kyoji into her amazing life story. After an old studio was torn down, a TV interviewer named Genya Tachybana and his camera man Kyoji Ida go to the home of the old studio's greatest female star, Chiyoko Fujiwara. As they interview her, Genya gives her a key. An old movie studio is being torn down. TV interviewer Genya Tachibana has tracked down its most famous star, Chiyoko Fujiwara, who has been a recluse since she left acting some 30 years ago. Tachibana delivers a key to her, and it causes her to reflect on her career; as she's telling the story, Tachibana and his long-suffering cameraman are drawn in. The key was given to her as a teenager by a painter and revolutionary that she helped to escape the police. She becomes an actress because it will make it possible to track him down, and she spends the next several decades acting out that search in various genres and eras. I thought it was a totally awesome anime movie. The above description came from AmandaT, and was edited by yours truly (contact me).